Moving with Pack “N” Load containers from Action 9A is the self storage that makes a "House Call" for residential or office moving. If you have stuff that needs to be stored, we will deliver our self-storage containers directly to your home or office. You can pack the storage containers at your own pace or have our professional movers pack it for you. Either way, we eliminate the hassle of renting, loading and unloading a moving truck or trailer. Call our friendly staff at 904-696-9191 to learn more about the great deals at Action 9A moving & storage. Action 9-A Inc. will deliver your Pack “N” Load container to your door for you to pack, we pick it up and safely store your contents until you're ready for us to deliver the containers to your new location. 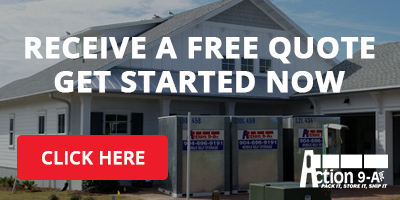 Use our website's convenient "Get A Free Estimate" contact form for a free moving quote and to learn more about our monthly specials or call us at 904-696-9191 for the best moving rates in Jacksonville, Florida. Looking for: Tips for Easy Packing?